We love snacking. You could even go as far as to say it’s our greatest skill. If there is anyone that knows how to snack better than us (this means they’re seriously good at it) it’s Red Rock Deli. Heck, they’ve devoted their whole business to it. That's why we've called on Red Rock Deli to play resident snack expert, and pair their new, hella luxe Special Reserve flavour range with some of our favourite wine varieties (who are we kidding, they're all our favourite), so you're equipped to enjoy your snacks in style—no matter the occasion. Whether you're kicking it on the couch or entertaining for hordes, these totally la-di-da snack and wine pairings are about to take your nibbling up a notch (did we mention they have a champagne flavoured chip? Yeah. We know). Hope you’re hungry; these are only snack and drink pairings you’ll ever need! Truffle has a rich, heavy, and earthy flavour which pairs perfectly with the fruity notes found in our favourite white wines. In particular a Pinot Gris. 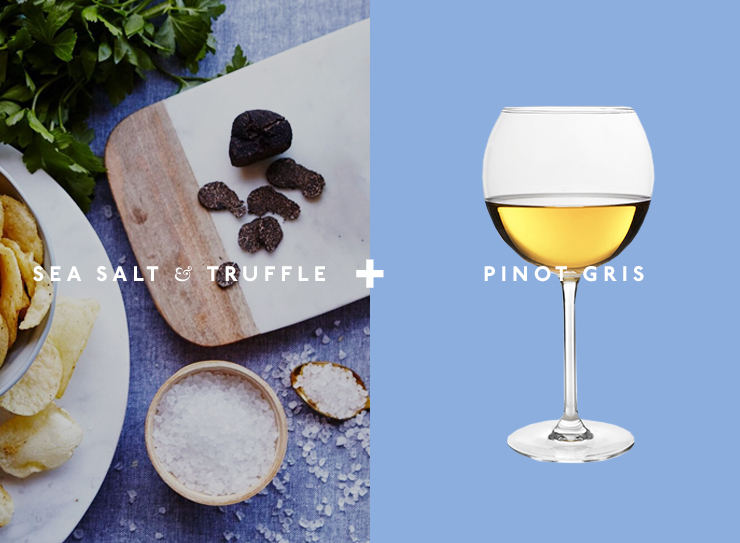 Pinot Gris has a striking earthy tone that matches perfectly with truffle's famous richness. Hands up if you have ever found yourself wishing for champagne flavoured everything, or champagne to pair with your champagne? Surely it’s not just us, right. Right?! Red Rock Deli's Champagne and Shallot flavour pairs perfectly with a glass or two of bubbly served over laugh-filled conversations with your best friends, or as the perfect snack before your next social event. Dig in! Champagne is often treated as a drink made purely for a celebration, which means it can be forgotten when it comes to pairing with food. But that is a real shame. 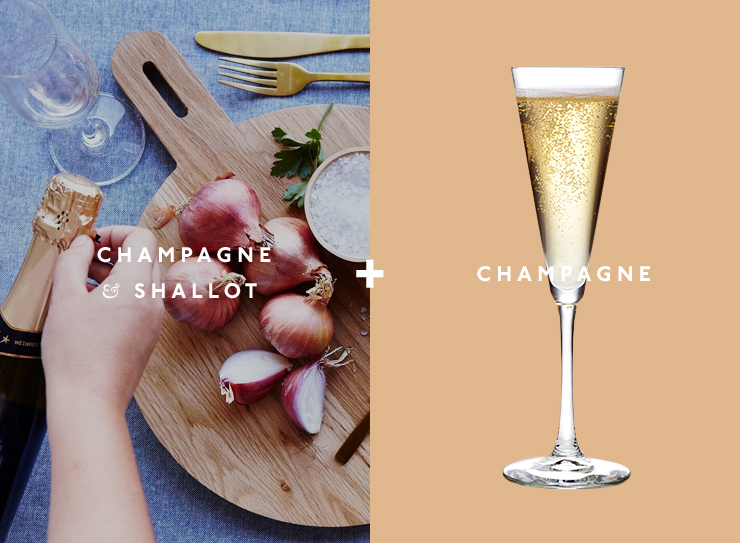 Champagne goes beautifully with food, and is best when paring back stronger flavours, so something like shallot or even garlic makes for a magic partnership. Given champagne's signature bubbles, it works a treat with other textures. Something light and crunchy works well; think crispy skins, crunchy potatoes, or crisp fruits. 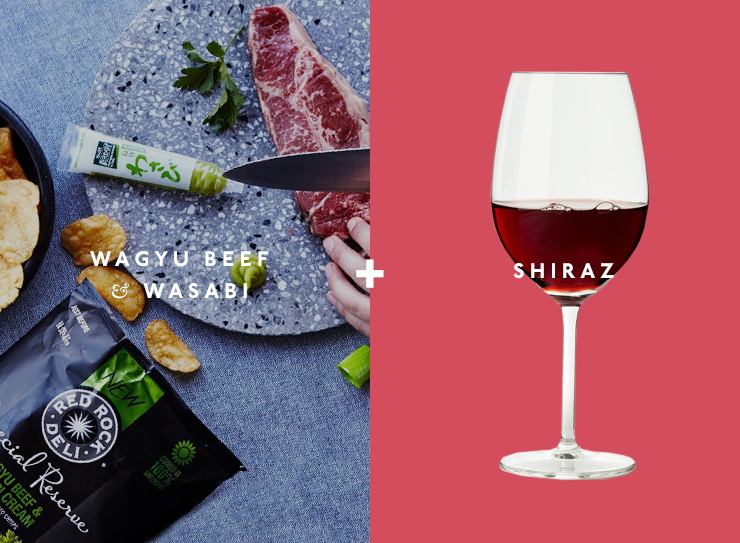 The oriental flavours of premium Wagyu and creamy, yet delightfully punchy, Wasabi lend themselves perfectly to the dark, full-bodied notes of a Shiraz. To reach snack nirvana pair a bowl of Red Rock Deli's Wagyu Beef and Wasabi Cream with a bottle of the good stuff—cue impressed guests, and seriously sated tastebuds. Best served with a hit of culture. Think an eye opening doco, a dose of the news, or spirited conversation. Cheers. The marbled, creamy flavours of Wagyu pack a serious punch, which is why it needs to be paired with a bold wine (hello, Shiraz! ), which can cut through the rich flavours and hold its own. Opting for a full-bodied red allows the complexity to wrap perfectly around the profile of Wagyu, complete with notes of peppery-spice, and a hint of chocolate. It’s a match made in snack heaven. Need more inspiration? Be sure to check out Red Rock Deli’s Special Reserve in store. We've teamed up with Red Rock Deli to bring this guide to snacking. For more information on our editorial policy, click here.